The 10.5 mile Tongue Mountain Range Trail is a popular hiking destination in the Lake George Wild Forest of the southeastern Adirondacks. The trail features many spectacular views as well as two lean to shelters for backpackers. The trail tends to be dry, so it important to bring plenty of water. This area is also the home of timber rattlesnakes, so be sure to be alert and cautious for these species especially on rocky ledges in the sunlight. But remember they can be found anywhere in this area. There is a DEC parking area along NY 9N, north of Lake George. The GPS coordinates of the parking area is N43 39.678 W73 32.711. From the parking area cross NY 9N and pick up the trail near a DEC sign along the road. This is the northern end of the Tongue Mountain Range Trail. The trail starts off going parallel to NY 9N but then at 0.1 miles it turns left. The trail now begins to climb and you might find much of this section eroded from a storm in 2014. At 0.6 miles reach a marked junction. This is the junction of the Deer Leap Spur Trail on your left. Continue on the Tongue Mountain Range Trail as the trail is still climbing up Brown Mountain. Soon after passing the 1965 foot summit of Brown Mountain there is an overlook with a nice view at 1.7 miles. You will be following rock cairns as you cross over an open rocky area at 2.4 miles. The Five Mile Mountain Lean To is reached at 2.6 miles. This shelter is also known as the Tongue Mountain Camp Lean To. There is a really nice view from near the lean to. After the lean to there are more views and you'll find blueberries in season. The 2258 foot summit of Five Mile Mountain is reached at 3.5 miles. There are more views just past the summit as well as from off the trail. But be AWARE of rattlesnakes if you decide to wonder off trail. A stream is reached at 4.4 miles, however it probably is dry most of the time. Reach the intersection of the Five Mile Point Trail at 5.0 miles. To the right leads 1.9 miles to the Clay Meadow Trailhead Parking Area and to the left travels 1.7 miles to the shore of Lake George at Five Mile Point. Continuing straight on the Tongue Mountain Range Trail, reach a yellow marked side trail at 5.6 miles that travels 0.25 miles to the Fifth Peak Lean To. The views from this lean to may be the best from any lean to in the Adirondacks. The views are getting better and better as you continue along the Tongue Mountain Range Trail. At 6.1 miles the trail turns left and reaches a nice view of Northwest Bay. You'll see a sign that tells you to turn right at 6.3 miles. At 6.5 miles reach the top of Third Peak. There will be some switchbacks before you reach the 1736 foot summit of French Point Mountain at 7.3 miles. Soon there will be a spectacular view of The Narrows of Lake George. At 7.5 miles there are more real nice views. At 8.5 miles reach the 1572 foot summit of First Peak. At 9.2 miles there is a view of the Point of Tongue. There are more views as you continue your descent toward the shore of Lake George. At 10.2 miles reach the junction of the Northwest Bay Trail. At 10.5 miles reach Montcalm Point and the end of the Tongue Mountain Range Trail. If you know someone with a boat, they could pick you up here. It is nearly a five mile hike to the Clay Meadows Trailhead Parking Area for those of you that did a car shuttle. If not, remember that you are 10.5 miles from the Deer Leap Parking Area. The Clay Meadow Trailhead Parking Area is located along NY 9N. The GPS coordinates are N43 37.763 W73 36.506 for those who have a GPS devise. 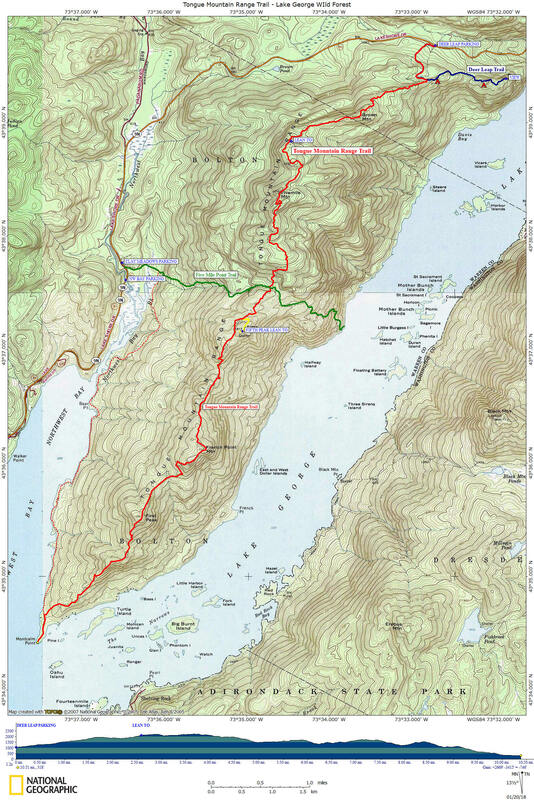 You can find more info on this hike as well as many other hikes in this area by purchasing the Hiking Guide to the Adirondack Eastern Trails . Look below for a map of the Tongue Mountain Range Trail. Be aware that according to some DEC signs the whole trail is 11.7 miles and some guide books have it at 11.2 miles. I GPS'd the trail at 10.5 miles and the DEC sign at Deer Leap Trailhead says 10.4 miles. Believe what you want.